Why I read this: The back cover blurb sounded good. Penniless, desperate and determined, Maggie Stanley grabs her small baby and runs into the snowy Idaho night, fleeing a dangerous, hurtful life. Now, in her loneliest, blackest hour, a handsome, down-and-out stranger's compassion shines forth like a torch in the darkness, offering her the warmth and comfort she has always longed for but has never known. But though tenderness lives buried deep in Rafe Kendrick's heart and though Maggie sees a soul wounded like her own in the depths of his startlingly beautiful eyes she knows she must never, ever trust any man again. Rafe, however, is more than he seems—an enigmatic man of secrets who could give Maggie the moon and stars, had he not solemnly vowed to spend the rest of his life alone. But sometimes, without warning, love can transform a cold, pitiless world into paradise. And a man who has lost nearly everything, a woman who has forgotten how to dream, and the helpless child who needs them both can truly become that most wondrous of creations: a family. Rafe, the hero of this book, is going into my top 10 Best Heroes list. Rich, charming, loves kids, a protector, good looking, good in bed, etc. You name, Rafe has got it. Baby Love captivated me from the very first page. The entire time I was reading it I didn't want to put it down. I'll admit to the fact that the book is cliche in the sense that it is a rich man with a nice family who saves the poor, single mother and loves her baby right from the get-go. The over all scenario that brought the couple together is not one that I relate to or even believe could happen this day and age, however, the way it is written makes me believe it. Besides the villain, there is a cast of wonderful characters that I fell in love with the instant I read them. 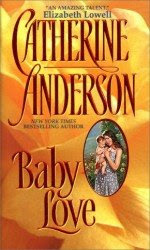 B+ for Catherine Anderson's Baby Love. I haven't read enough Catherine Anderson. I must work on that. Someday. I've heard such wonderful things about her books. Kate Diamond // 1:09 p.m.
Rafe IS a good name. Was the villain well-done? Did you love to hate the villain? I think I've read this book years ago but I don't remember much of the book only that I enjoyed it. I read it long before I started blogging but man I'm gonna have to go and dig this out and read it again. Thanks for the review! Catherine Andersen is one of those authors you have to be careful not to overdose on. The problem is that ALL her heroes are like this one: Perfect and almost sugary sweet. Which is fine in small doses, but as we all know too much sugar can leave you with a toothache. Katiebabs/ KB // 1:45 p.m.
You should read Annie's Song by Catherine. That book made me tear up. I've got a lot of Catherine Anderson's books - believe it or not, I've never read any of them. This sounds like a great one, though!